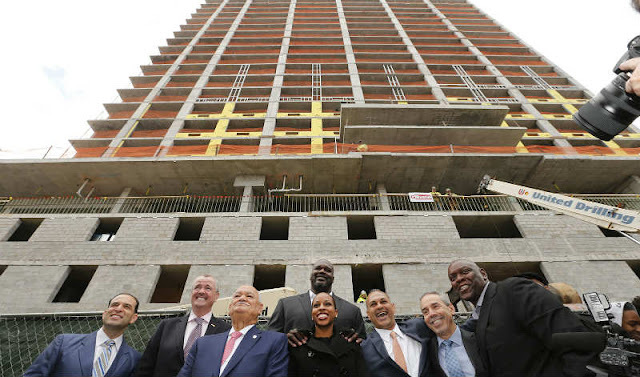 Former NBA superstar Shaquille O'Neal is making his mark on his hometown skyline with two new apartment complexes that he is building in Newark NJ. And much like the 7-foot-1-inch sports legend, the 22-story apartment complex -- colloquially called "Shaq Towers" -- will hover over the city's downtown as its first high-rise in more than 50 years. "I remember when I was growing up (the city) used to be beautiful like this so the older I get, I want it to be a little more beautiful," O'Neal told NJ Advance Media. "I invest in things that are going to make a difference." On Tuesday, O'Neal, a Newark native, was joined by Gov. Phil Murphy, Lt. Gov. Sheila Oliver and Mayor Ras Baraka to mark a milestone in the building's construction. "Yet another piece of evidence that this city is on the rise, let there be no doubt about it," Murphy said. "This is a city that has got a trajectory that is undeniable ... as our big urban centers go, first and foremost as Newark goes, so goes the state of New Jersey." The $79 million luxury apartments, developed by Boraei Development and O'Neal, are steps from the New Jersey Performing Arts Center and the renovated Hahne & Co. building that includes a Whole Foods and the newest restaurant by celebrity chef Marcus Samuelsson. The 168 apartments at 1 Rector Street will open by the end of the year with residents able to apply for a lease as soon as September, Wasseem Boraie told NJ Advance Media. He said the company bought the property -- which used to house the old Science Park High School 10 years ago -- but construction didn't begin until last October. "We were waiting for the right time," Boraie said, citing new businesses in the area. "We all then build up around the supply." O'Neal also announced a new $150 million, 350-unit apartment complex with Boraie (whom he called "the Kobe Bryant of development"). The 35-story building on 777 McCarter Highway will be known as the "House that Shaq Built," O'Neal said.